I made a promise not to discuss Bill O’Reilly in this space too much. But, this post isn’t really about him. It is about White America’s difficulty in understanding the moral imperative we all have to ensure that undocumented workers, parents, taxpayers, church members, and peers get the right to live in America freely. After President Obama’s proclamation to pass an executive order ensuring this freedom, many Whites in the news media – instead of arguing the economic and social merits of the President’s actions – lashed out at undocumented people and the President directly. If this isn’t a case study in White Supremacy, I just don’t know what else is. After watching President Obama’s speech Thursday night, announcing his plan to enact immigration reform by executive order, White conservatives on Fox News went into a full on tizzy regarding the President’s legality, legitimacy, and right to force-feed changes on immigration policy to a Congress which has been intentionally challenging the President on this very issue for years. According to Raw Story, the “order is expected to allow 4.7 million undocumented immigrants to avoid deportation and apply for jobs legally provided they have lived in the U.S. for at least five years.” It isn’t a permanent solution and it isn’t amnesty. It is a small triumph for Democrats who were trounced in this year’s midterm elections. President Obama makes this move on the heels of calls from Latina/o voters that he make good on his 2008 campaign promises on immigration reform and stop the burgeoning deportation rates his administration has become synonymous with. Seems he is making a valiant effort here. Conversely, rather than noting how unreasonable this Congress has been on immigration reform (or legislation in general), the overwhelming reaction from White conservatives in particular has been to avoid the legislative process and instead attempt to strong-arm folks on the left by threatening to hold the government hostage (again). This is a similar tactic to those they used when they allowed the government to shut down over the Afforable Care Act. Even after millions have benefited from “Obamacare,” White conservatives continue to peddle the narrative that it is harmful to Americans. It seems no matter the forecasted – or actual – benefit of President Obama’s recommended legislative programs, Whites will paint them (and him) as inherently bad for America. Immigration reform, since it is supported by President Obama, is suffering the same cruel fate as health policy in the United States. 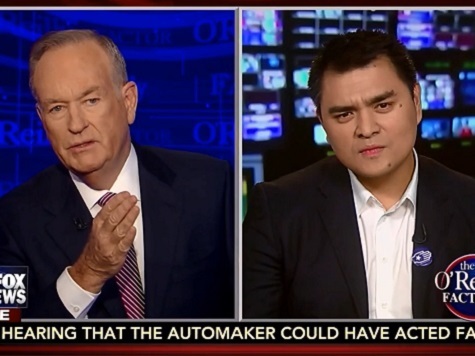 Further symbolizing White America’s problem with immigration reform, Bill O’Reilly, on last night’s O’Reilly Factor, went so far as to tell undocumented journalist and activist Jose Antonio Vargas “You don’t have an entitlement to be here.” This, coming from a White man whose entitlement to occupying colonized, indigenous lands in the US simply stems from the singular fact that he is White. Here’s the truth: Vargas does have an entitlement to be here. He is no more foreign than a White American child who arrives here in adolescence with parents after being born abroad. He arrived here when he was 12 years old from the Phillippines to live with his grandparents and hasn’t been able to visit his family abroad for fear of being permanently deported. This is not freedom nor is it liberty. When O’Reilly asked about the types of folks who have undocumented status – alluding to the assumption that somehow undocumented immigrants are more criminally inclined than documented or naturalized citizens – Vargas made a very valid point. In a country whose matriarchal symbol situated prominently on our northeastern shore says clearly, “Give me your tired, your poor, your huddled masses yearning to breathe free, the wretched refuse of your teeming shore. Send these, the homeless, tempest-tossed to me, I lift my lamp beside the golden door!” I’d say Vargas, and other undocumented folks, definitely have an entitlement to be here. White entitlement and feeling threats to White Supremacy are unqualified in denying that fact. At some point, I hope enough White people will understand that we are a nation of immigrants. When White Imperialists stole this land from Indigenous Americans, they declared themselves the original owners. Just because they wrote the history books, made the laws, manipulated public opinion, and intimidated the rest of the country with threats of violence doesn’t make that myth either rational or true. Let’s stop with the entitlement conversation and move past the ignorance of White Supremacy. As a country, we have to be better and more responsible than that. If you missed President Obama’s speech last night, see below. Next story I Have No Words for Tamir Rice.